Preheat your oven to 425 degrees. Take 2 baking sheets and line them with aluminum foil, spraying the foil with nonstick cooking spray afterwards. Divide the chicken wings between the two lined sheets, sprinkling the salt and pepper onto the wings afterwards. Place one baking sheet on the middle rack and the other on the bottom rack. Cook for 30 minutes, then switch places with the baking sheets and continue cooking for another 30 minutes. While the chicken wings are cooking, take a large mixing bowl out and whisk together the soy sauce, honey and sriracha in it. Once the chicken wings are fully cooked, place them in the bowl, tossing to coat in the sauce. 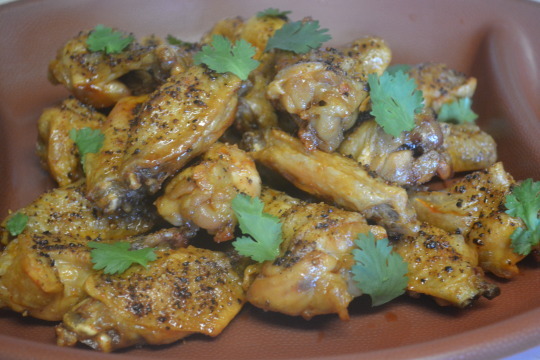 Place the chicken wings on a plate afterwards and sprinkle the cilantro on afterwards. Serve immediately. 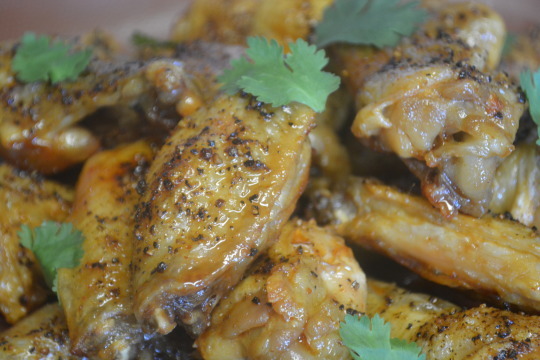 These wings live up to their name, there’s a really nice balance of sweet and spicy in it. The cilantro does add a nice freshness and works with the other flavors but if you don’t like cilantro then you can omit it and still have a tasty chicken wing on your hands !